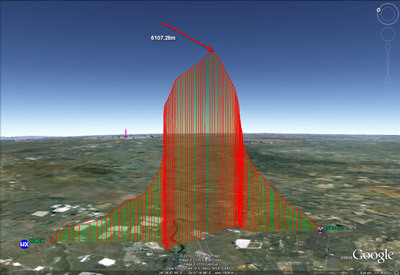 Welcome to the HABEX web site where you can find information on this High altitude balloon project for the schools. The "about us" page will give you more background information regarding this project. The Data sheet for the latest flight has been added to the respective flight page and can be found here. There will be a couple of APRS units, the main unit being on 144.850Mhz. The remainder will be on the usual 144.800Mhz. Habex will once again be taking to the air. The group has just recieved confirmation via CAMU that the launch has been approved and that a "Notam" (Notice to airman) has been issued for the flight. The date set for the flight is Saturday the 30th November at the Klerksdorp airfield (FAKD / KXE). Duration of the Operation is 0400Z - 1200Z. More information will be posted here shortly with updates there after. Well, there is one week left till launch. Assembly and testing is going well and the payload string is growing. Currently there will be the standard controller, a X Band repeater with APRS unit, HF beacon and lastly a camera at the botton with its own APRS unit as well. Special thanks must go to two of our sponsors for making this possible. They are RF Design for radios and GPS equipment and Afrox for the Gas we need. Oh dear. Unfortunately errors creep into the system and the date mentioned below for the next balloon launch at the Klerksdorp Hamfest is wrong. We all unfortunately thought it was on the 4th June. Fortunately an alert Ham member in Klerksdorp noticed the error and informed us. So, the next launch is actually the 2nd July 2011. Please make an effort to view the balloon launch or just track it. Also, come to the Hamfest being organised by the Klerksdorp ham fraternity. We are sure you will have much fun. On the 14th May, the Habex team will be performing tests on the payload at the Benoni Hobby fair. A new cross band repeater will be tested as well as the controller board. Please come and join us and have a look at all the hobbies on offer. Location is the John Barable hall in Benoni. Address is corner O'Reilly Merry St and Brodigan Avenue. On the 4th June, the organisers of the Klerksdorp Hamfest have asked the Habex team if they would be interested in launching a balloon during the event. The Habex team was very quick to reply with a yes. Currently, the team is discussing the payload. What looks like a certainty is a 2m/70cm repeater with APRS. The repeater will RX on 2m and TX on 70cm's. Still being investigated is APRS being injected at the end of each over or at least after a certain time. More information is to follow on this. There will also be the standard Habex control board with software modifications to the control unit. A payload plan and more information will be posted as arrangements are finalised, so please visit the site regularly to keep up to date. Habex 2 turned out to be a great success. 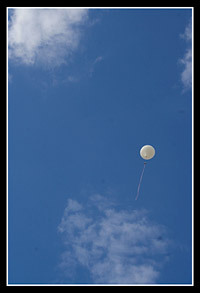 The balloon reached an altitude of just over 6100m above sea level and was retrieved effortlessly. Habex 1 turned out to be one of those days you would like to forget. 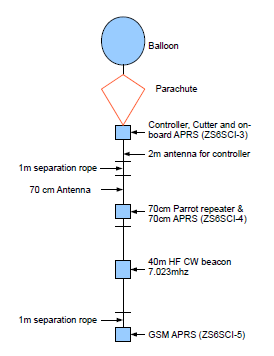 The APRS unit used to track the balloon failed the minute it left the ground and the payload was never seen again. However, look at the flight page. There is the data sheet as well as many photos of the day. Photo on the left is the balloon heading skywards.